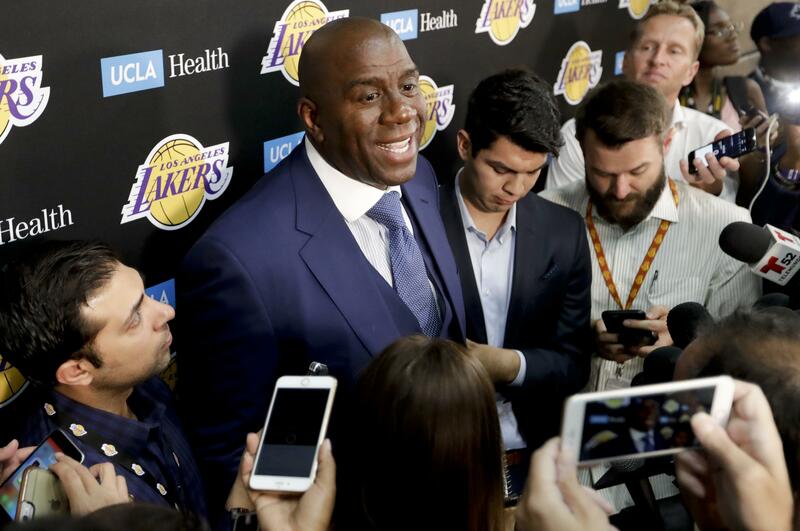 UPDATED: Fri., Oct. 6, 2017, 7:34 a.m.
After an assist by his attorney, Earvin “Magic” Johnson will not be called to testify as a witness in an upcoming federal fraud trial in Spokane. The Los Angeles Lakers president had been subpoenaed to appear at a trial against the money men behind a 2012 project that would have paid Johnson $750,000 to attend a celebrity golf tournament at the Coeur d’Alene Resort followed by a concert by legendary country music band Alabama. But the funding collapsed and the events never occurred. “This is nothing more than a transparent attempt to shift the focus from the serious charges pending against Mr. Thompson” – one of the event’s organizers – “to the inevitable media frenzy that would result from Mr. Johnson’s appearance in the courtroom,” Johnson’s attorney, William Briggs, wrote in a motion last week. U.S. District Court Judge Thomas Rice agreed. On Friday, he ruled Johnson will not have to testify in the fraud case against Vassily A. Thompson, of Los Angeles, and Derrick J. Fincher, of Spokane Valley. Both men face 17 counts, including conspiracy to commit wire fraud, wire fraud and aggravated identity theft. John P. Nixon, of Philadelphia, pleaded guilty last week to one count of conspiracy to commit wire fraud in the case and has agreed to testify against Thompson and Fincher, said Spokane attorney David Partovi, who is representing Thompson. According to court records, Thompson, Fincher and Nixon claimed to have access to tens of millions of dollars through lines of bank credit. To access that credit, the suspects charged fees to several alleged victims, including $160,000 from Coeur d’Alene golf tournament organizers; $1.3 million from investors in Montana; and $855,000 from a developer in North Carolina. In each case, the paid fees never led to promised lines of credit. In some cases, according to court records, the victims received legal documents approved by an attorney who was dead. Partovi said his client intended to make good on all the promised financing, but partners backed away from the complex financial deals once they learned that Thompson, Nixon and Fincher were under federal investigation. The golf tournament fiasco started after Fincher contacted organizers, including Patti Ziebell, who was trying to raise $4 million for the celebrity golf tournament. Fincher, according to court records, said he knew investors who could provide $6 million for the event after organizers paid $160,000 to access the $6 million line of credit. Separately, Ziebell had promised to pay Johnson half of the $750,000 appearance fee up front and the balance just before the tournament. However, Ziebell only paid Johnson $100,000, according to court records. Johnson’s executive assistant Natalie Wilson spoke infrequently with Ziebell until July 2012 when “Ziebell notified Ms. Wilson that the tournament had been canceled because certain sponsors had withdrawn,” Briggs wrote. Partovi said he subpoenaed Johnson to testify, but got all the information he needed from Briggs’ court filing. However, Partovi said in court that he will continue to seek the testimony from Wilson about the terms of Johnson’s appearance fee in 2012. The trial was set to begin on Oct. 16, but Rice moved the trial date to Jan. 29 to allow defense attorneys more time to work with court-approved experts. However, Assistant U.S. Attorney Scott Jones told the judge that federal investigators believe Thompson may be continuing the same kind of transactions that led to his pending charges. Jones suggested that more charges could be coming. Published: Oct. 5, 2017, 1:34 p.m. Updated: Oct. 6, 2017, 7:34 a.m.